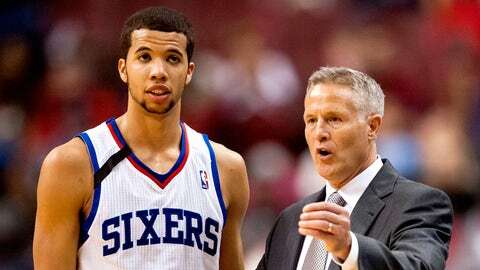 Michael Carter-Williams is off to a solid start with the 76ers. It seems like we’re always hearing about a former professional athlete losing all of their money. Well, apparently Philadelphia 76ers rookie Michael Carter-Williams has heard those stories, too, and doesn’t want that to happen to him down the line. Nowadays, Carter-Zegarowski and her best friend, Tracie Tracy, are running his management team. They are taking a proactive approach to make sure he doesn’t spend all his money in a couple of years. His rookie contract guarantees him $4.5 million over his first two seasons. He could make a total of $10 million if the Sixers pick up the final two seasons of his contract. But his salary is deposited into a trust he can’t touch for three years. Carter-Williams is living off endorsement deals with Nike and Panini trading cards.